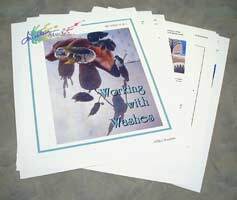 These workbooks complement the free tips found on The Watercolor Learning Center website. They cover a specific area in greater depth than do the tips, and are designed for beginning to intermediate painters. Designed to help you develop the practice of painting, they include painting assignments and exercises, plus evaluation questions to help you assess your progress. Workbooks are in PDF format for easy printing from any printer. You need Adobe Reader® to open and/or print them. Reader is usually on a computer; double click the PDF file and it should automatically open, but if you don't have Reader, you can download it free from Adobe.com or get the app on your smart phone or tablet. When you purchase the workbook(s), PayPal notifies me so that I can email you the PDF file. If you haven't received an email with the PDF attached within 24 hours of your purchase, email me directly, or check your spam mailbox.